Do you want to serve a healthy recipe that your family will enjoy? Eggplant in the Oven may be your ticket if you want something new to serve on the dinner table. Eggplant is full of nutrition. The vegetable has a high fiber content, which aids digestion. It also helps protect against coronary heart disease, has cancer fighting properties, helps regulate blood pressure and balances your salt intake, which aids your body in keeping hydrated (not an excuse to give up on drinking water!) Eggplant is known for its unique taste as well as its texture. The vegetable is best enjoyed between the months of August and October in North America. Most eggplant growers are in the countries of Italy, Egypt, China, Japan, and Turkey. You will notice that eggplant has glossy skin and the flesh is spongy and is a cream color. The reasons eggplant is used in many recipes is not only because of the flavor, but because they absorb the juices and taste of other ingredients. This is one reason eggplant tastes delicious in casseroles, lasagna, and this Eggplant in the Oven recipe. Don’t forget to print the recipe card and to watch the video tutorial below. Place ground beef in a pan with a dash of salt and pepper. Heat until the beef is no longer red. Set aside. In a separate pan, cook the eggplant, tomatoes, olive oil, and garlic until eggplant is fully cooked. 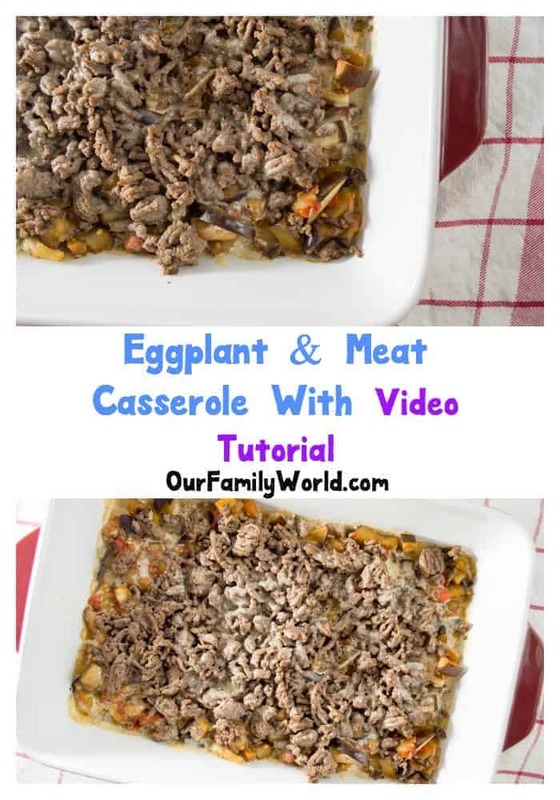 Place the ingredients in a greased casserole dish layer by layer in this order: eggplant mixture, ground beef, then cheese on top. If you would like it to be more creamy, then you can add 4 tablespoons of cooking cream. Cover the casserole dish with aluminum foil and bake for 20 minutes. While eggplant can be an acquired taste, many people do not notice it when it is cooked, particularly when it is baked, like with this Eggplant in the Oven recipe. This healthy recipe will please even your pickiest guests. The garlic gives it a wonderful flavor and the tomatoes blend in so nicely with the eggplant. This healthy recipe is very satisfying and your guests will be impressed. What is your favorite healthy recipe? Does it include any eggplant dishes? Girl Bullying: How Does it Affect Your Daughter’s Self Esteem? What kind of cheese and how much? Didnt see it in ingredient list. Thanks! Colleen, the cheese you can use depends on your taste. I prefer Mozzarella, but you can use another type if you wish. I usually put in about 1/4 cup. Thanks and enjoy! As much as I love eggplant, I have never actually made it myself! Thanks for the easy recipe, now I want to try it! It will come out great, Jennifer! Everyone in my family–except my husband–likes eggplant. I bet he might even like this one. Thanks for sharing. Yum!! I love eggplant so this sounds super yummy 🙂 Thanks!! We use eggplant in a lot of recipes! Love eggplant, but I never know what to make. Thanks for the recipe. Aacua Product Review – The 4 in 1 Multi use Towel! !